Wouldn’t it be nice if you didn’t have to pay for your perfect wedding, and you got a free car to boot? Well, if you are a bride-to-be that lives in Illinois, Missouri, Iowa, Wisconsin, Indiana, Michigan, Ohio, or Kentucky, that dream just may come true. Dodge is hosting its first-ever “Journey of a Lifetime” contest, and the winners will receive an all-expenses paid wedding, as well as a Dodge Journey to start their journey together with. The catch is that to be a contender, you have to be from one of the 8 states listed above, and, oh yeah, you’ll have to have the ceremony on the floor of the Chicago Auto Show on February 14, 2008. Sorry. You would, however, be allowed to invite up to 100 of your closest friends and family to the even, and you’d be able to pick out your dream dress, flowers, cake, and other wedding day must-haves free of charge. Want to know even more? Well, I’m tired of writing, so I guess you could just check out the Journey Contest website. Good Luck! Singer Kanye West has been engaged for awhile, but plans to tie the knot by the end of this year. Though the original plan wasn’t for West and his fiancée Alexis Phifer to be wed this month, everything changed upon the rapper’s mother’s untimely death. Donda West underwent routine plastic surgery in mid-November, which tragically resulted in her death. Mrs. West’s last wish, however, was for her son to settle down. Kanye and his bride-to-be plan to do just that. No details regarding West’s December-set wedding have been released to date. In spite of the sad events surrounding their big day, we hope Kanye and his soon-to-be bride enjoy their wedding and holiday season. Cheers! I know some men don’t always like to wear their wedding bands. But a man in Jackson, Mississippi proved why they always should. Donnie Register has a big reason to be thankful he’s married right now. His wedding band deflected a bullet during a robbery and possibly saved his life. Two men walked into Register’s antique store and asked to see a coin collection. When Register went to get the collection, one of the men pulled out a gun and demanded money. During the robbery, shots were fired and Register raised his left hand. The police say that his wedding band deflected the bullet, probably saving his life. “The bullet managed to go through two of his fingers without severing the bone. A part of the bullet broke off and is in his middle finger. The other part is in his neck, lodged in the muscle tissue. But it’s not life-threatening,” said his wife, Darlene Register. I bet next time Darlene tells her husband to wear his ring, he will! Mens Wedding Rings – Gold, Titanium, Platinum, oh my! It’s confirmed! Jennifer Love Hewitt is engaged; something it seems she’s been looking forward to for quite some time. According to a recent article, Hewitt confirmed her engagement exclusively with Us Weekly this past Wednesday before getting away from it all on a Hawaiian vacation with her beau. Hewitt and her new fiancé, Ross McCall haven’t released any additional information regarding their upcoming wedding, but it’s sure to be a fairy-tale event. The couple first started dating early in 2006 after they met on the set of Hewitt’s show, The Ghost Whisperer, and they have been inseparable ever since. Hewitt was thinking about marriage as far back as May of this year, when she reportedly visited a psychic to make sure McCall was ‘the one.’ The Ghost Whisperer star was “thrilled” when the medium said he was. I’m sure we’ll hear plenty more about this happy couple as they begin to plan their dream wedding. Until their big day, though, let’s hope they’re enjoying their love-filled engagement! Grey’s Anatomy’s beautiful Katherine Heigl recently announced her upcoming wedding date to singer/musician Josh Kelley. The adorable couple will get married in a winter wedding on December 23rd on Katherine’s secluded ranch in Utah. I’m sure the wedding will be beautiful and I can’t wait to see all the pictures. Though Heigl is enjoying preparing for her real life wedding to the man of her dreams, one of her upcoming characters isn’t so lucky. Or is she? In “27 Dresses”, Heigl stars as Jane, a young woman who has served as a bridesmaid 27 times. Jane is now having a hard time dealing with the idea of being her sister’s Maid of Honor as her sibling prepares to marry the man that Jane is secretly in love with. I can’t wait to see how the movie turns out as well! The film will be released in theaters beginning January 11, 2008. When Tony Parker and Eva Longoria were married in July, Tony decided to have their wedding date (in roman numerals) tattooed around his finger like a wedding band. Though the couple did exchange wedding rings and wear them often, Tony figured since he has to take his band off while playing basketball for the San Antonio Spurs, that it would be a nice gesture to get the tattoo. This way, he’d never be without his ring … even when he was without his ring. Eva followed suit and reportedly had her wrist tattooed with their wedding date as well. The Parkers aren’t the first celebrity couple to do this and certainly won’t be the last. Angelina and Brad exchanged tattoos as well. But celebrities aren’t the only ones adding the permanent symbol to their ring fingers. Many doctors, mechanics and machine workers, who can’t wear their rings regularly at work, are also getting tattooed wedding bands. What do you think about this trend? Is it an impressive statement of love and commitment? Or just a weird fad? Personally, if my husband or I couldn’t wear our rings all the time for some reason, I think I’d consider it. How about you? Here at Truly, we celebrate life and love by acknowledging milestone anniversary. These three couples will soon be celebrating their 50th wedding anniversaries! The Rev. and Mrs. Dale Wallace of Dustin, Oklahoma will celebrate their 50th wedding anniversary on Saturday, Dec. 1, 2007 with a reception in their honor. The couple has been blessed with three daughters, eight grandchildren and two great-granddaughters. Dean and Betty Griffin of Edneyville, North Carolina will celebrate their 50th wedding anniversary on Sunday, Dec. 2, 2007 with a reception at their church fellowship hall. The couple has three daughters and five lovely grandchildren. Curtis and Wanda Smith of Nampa, Idaho will celebrate their 50th wedding anniversary on Saturday, Dec. 8, 2007 with an open house celebration. The couple has two children, four grandsons and a great-granddaughter. In a secret ceremony this past weekend, Superman Returns star Brandon Routh married his girlfriend of almost 4 years, Courtney Ford. The ceremony took place on Saturday, at the El Capitan Ranch in Santa Barbara and was kept “hush hush,” according to the original article. 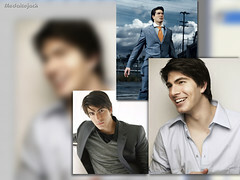 Routh and Ford met when the Superman star was working at the Hollywood bowling alley Lucky Strike as a bartender. The couple happened to become acquainted when Ford’s brother had his wedding rehearsal dinner party at the alley, and the rest is history. Earlier this year, Routh said regarding his fiancée, “Courtney is my own personal kryptonite. She brings me to my knees.” The couple had been engaged for a little over a year (Routh proposed in August 2006), and they only invited their closest family and friends to attend the private wedding ceremony. From all of us at Truly Wedding, we wish the happy couple a long, loving future together! A Rhode Island couple got married at the Honey Dew Donut Shop on Wednesday. “Honey Dew” is a such a fitting name! Cyndi LaRose and Joseph David Smith decided to exchange wedding vows at the North Kingstown donut shop where they met. The donut baker made the food and a probate judge conducted the ceremony. But it was the owner Faraq Mohamed and his donut shop that got the couple together. LaRose had been coming to the location for years and noticed Smith when he started coming in to see his niece, who worked behind the counter. Love blossomed when Mohamed asked them both to help him with an errand a few weeks ago. Two days after that, Smith proposed. The couple was in love and felt no need to wait. They picked out their wedding rings last week and said their “I Do’s” at the Honey Dew on Wednesday. I Scream for Ice Cream at Weddings! As the Royal Couple celebrates their 60th wedding anniversary, a couple in Hesston, Kansas prepares to do the same. Though, they won’t be having a party of hundreds of royal and celebrity guests, Enola and Nelson Dreier are just as noteworthy. The two were married on November 28, 1947 at Highland Evangelical Reformed Church in Newton, Kansas. Their children, which include three daughters and a son, are hosting a card shower in honor of the event. The couple also has 10 grandchildren and six great-grandchildren. Congratulations to the Dreiers! Here’s to many more happy years!